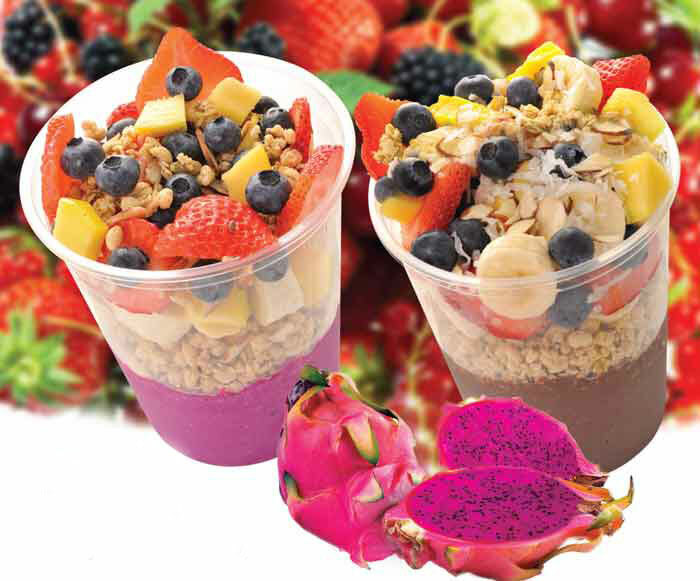 We are proud to have served the very fitst Acai bowl in San Diego. Pure organic acai pulp blended with organic soy milk and banana, topped with fresh fruit and organic gluten-free hemp granola. Served in a 32 oz. bowl. Choose between hungry size and mega size. Pure organic acai pulp blended with bananas, organic blueberries, organic soy milk and organic peanut butter, topped with fresh fruit and organic gluten-free hemp granola. Served in a 32 oz. bowl. Choose between hungry size and mega size. Pure organic acai pulp blended with bananas, organic apples, strawberries, beets, spinach, topped with fresh fruit and organic gluten-free hemp granola. Served in a 32 oz. bowl. Choose between hungry size and mega size. Pure organic acai pulp blended with bananas, organic espresso, dark cacao and organic soy milk, topped with fresh fruit and organic gluten-free hemp granola. Served in a 32 oz. bowl. Choose between hungry size and mega size. Pure organic pitaya mixed with organic almond milk and banana, topped with fresh fruit and organic gluten-free hemp granola. Served in a 32 oz. bowl. Choose between hungry size and mega size. Pure organic pitaya mixed with organic peanut butter, organic soy milk, peaches and mango, topped with fresh fruit and organic gluten-free hemp granola. Served in a 32 oz. bowl. Choose between hungry size and mega size. Pure organic pitaya mixed with organic blueberries, strawberries, organic rice milk and fresh spinach, topped with fresh fruit and organic gluten-free hemp granola. Served in a 32 oz. bowl. Choose between hungry size and mega size. Pure organic pitaya mixed with organic apple, ginger, boysenberries, strawberries and fresh kale, topped with fresh fruit and organic gluten-free hemp granola. Served in a 32 oz. bowl. Choose between hungry size and mega size.